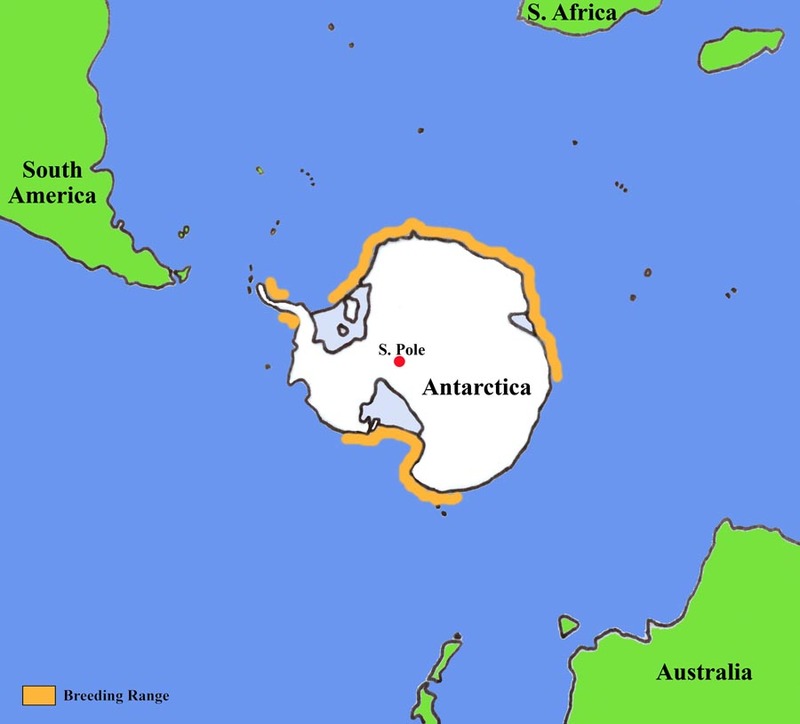 Emperor penguin colonies are found primarily on pack-ice along the coastline of the antarctic continent and immediately adjacent islands. Emperor penguins eat a variety of fish, crustaceans and cephalopods. The primary food source is generally fish, in particular the antarctic silverfish. Other fish, glacial and hooked squids and antarctic krill also regularly feature in the diet. Feeding may be in open water or on the underside of the sea ice where many of the small fish such as the Bald Notothen are found. Adult birds can dive up to depths of 500 meters and for longer than 15 minutes but will presumably remain much closer to the surface when food is plentiful there. Speeds of less than 10 km/h are usual, yet nearly 20 km/h can be reached over short distances. Apparently, the Emperor has been observed to blow bubbles into cracks under the ice to flush fish out of them. 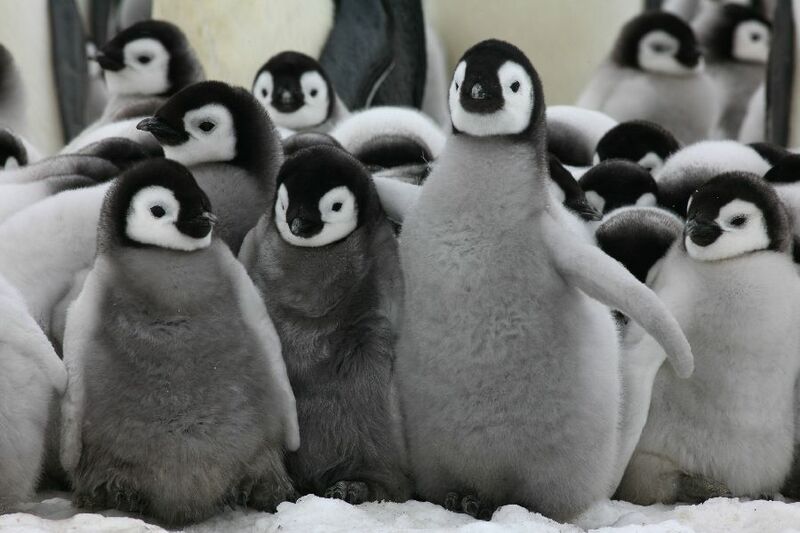 As with all penguins, the chicks are fed with regurgitated food once penguins have completed the often long walk back to the colony. 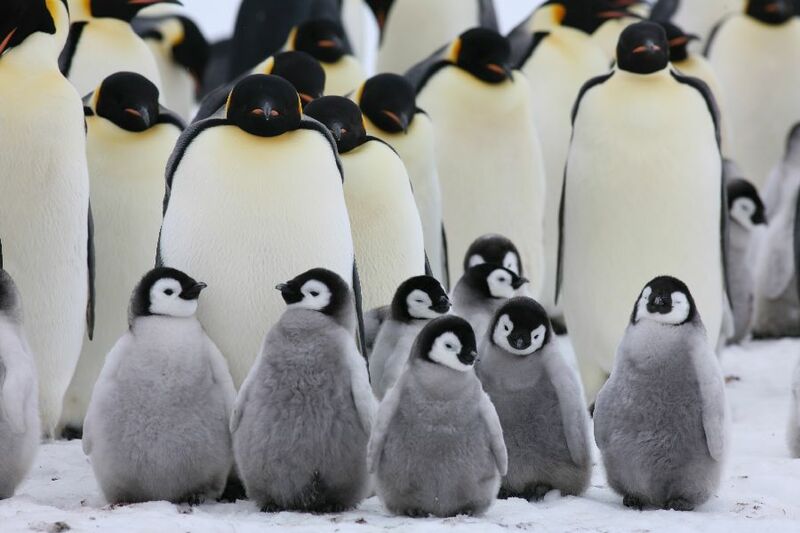 In March and April, probably in response to decreasing daylight, Emperor penguins walk as far as 120 km across the sea ice to their breeding sites. Courtship is instigated by the male by performance of the ecstatic display. After placing his head on his chest and inhaling, he stretches his head skywards, spreads his flippers and calls for a couple of seconds. 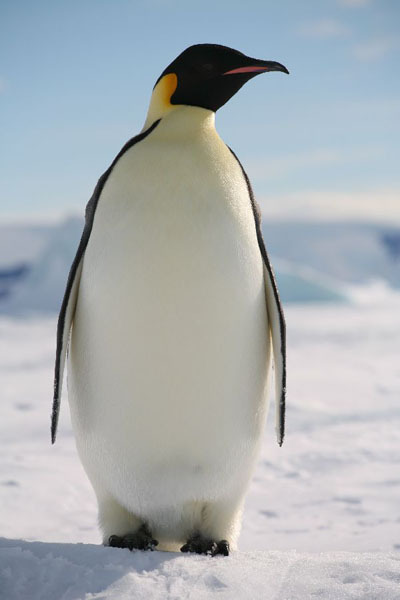 This is repeated as the penguin walks around the colony. 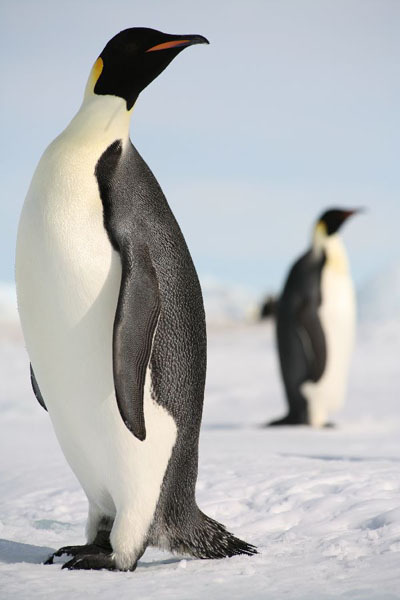 When the female joins in, both penguins stand opposite each other repeatedly stretching their heads skyward in synchrony for up to a few minutes. Both penguins eventually waddle around the colony for a while before deep bowing by both partners signals the readiness for copulation. 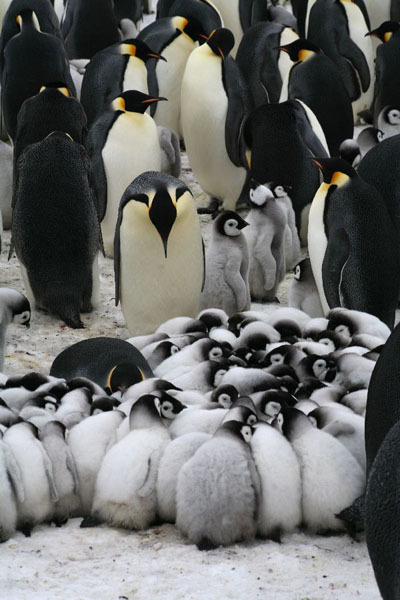 Whilst Emperor penguins may breed with the same partner as in previous years, this only happens in 15% of cases. A single egg weighing about 460 grams is laid in May or early June. 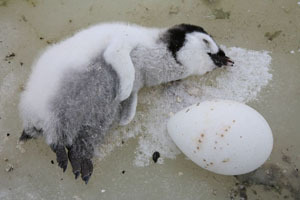 The egg is transferred to the male and the female heads off to sea to feed for about 2 months. The male is solely responsible for incubating the egg, which takes about 65 days. During this time, the male birds brave fierce weather conditions by huddling together. Continual slow shuffling of the birds in the huddle ensures that no bird remains exposed at its perimeter all the time. 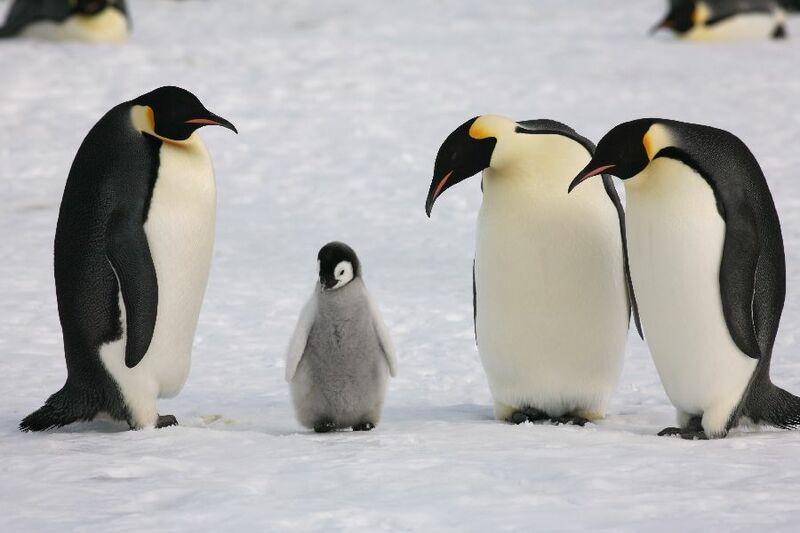 By the end of the incubation period, the male may have lost half of his body weight. 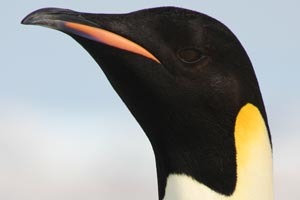 Ideally, the female returns at about the time the egg hatches (mid-July to early August). 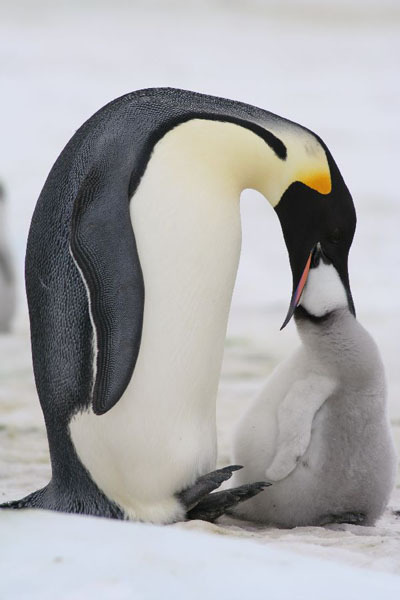 If the return is delayed, the father can transiently feed the chick with a proteinaceous substance produced by a gland in his oesophagus. 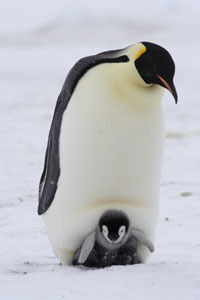 Normally the chick is fed fish regurgitated from the stomach of a returning parent. 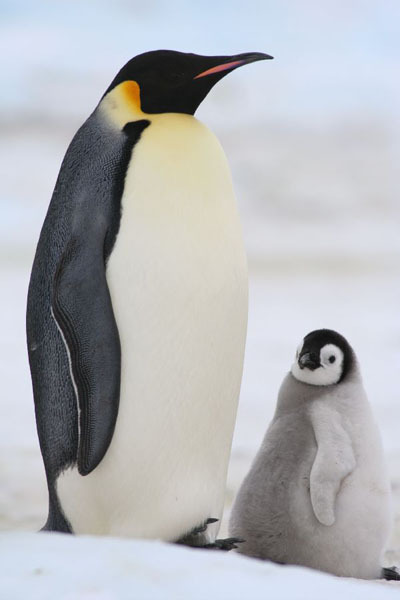 Once the mother has returned, the male bird can head out to sea to feed for about 25 days. For the first 45-50 days after hatching the chick must remain on its parents feet warmed by the brood pouch. After that it may join a creche with other chicks. The parents both still feed the chick whilst it is in the creche The chicks moult in Nov./Dec. and acquire their juvenile plumage. When this is complete in Dec./Jan. the birds go out to sea to start feeding. 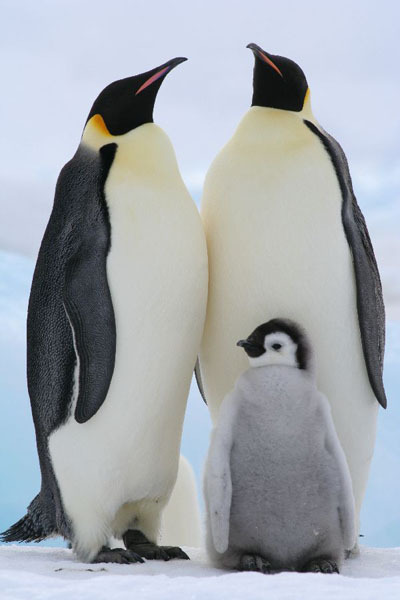 Emperor penguins usually reach sexual maturity after 3 years but generally only start breeding 1-3 years later. In order to adapt to extreme cold, Emperor penguins have developed unique forms of behaviour. 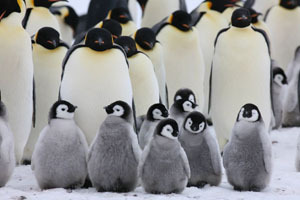 During the cold and dark winter months the male birds which remain at the colony form a compact huddle, also known as the turtle formation, where from tens to thousands of birds lean on each other and gradually shift positions so as each to benefit from the warmth in the core of the huddle. 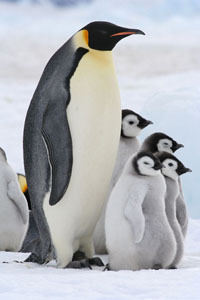 This behaviour can be observed in chicks in less extreme temperatures (see section above). 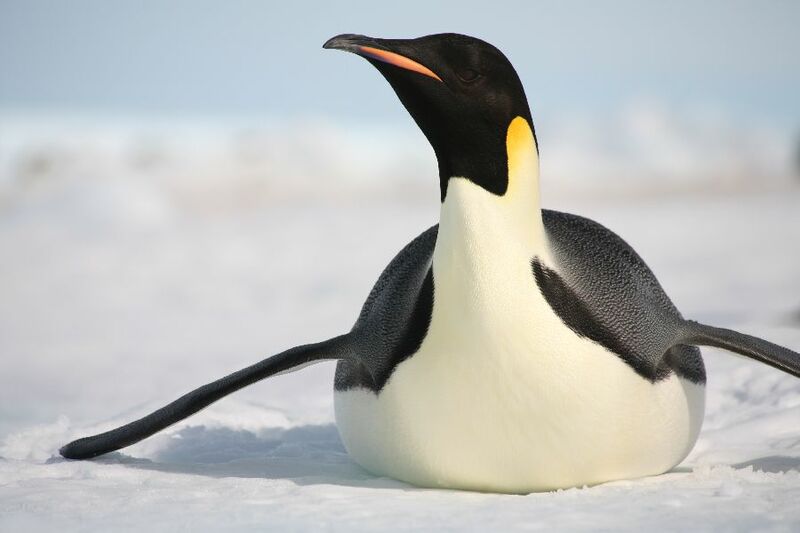 Emperor penguins travel long distances over sea ice to reach their colonies and in doing so spend a lot of time sledging on their bellies. The penguins can often be observed sliding single file in groups of 20-30 birds. 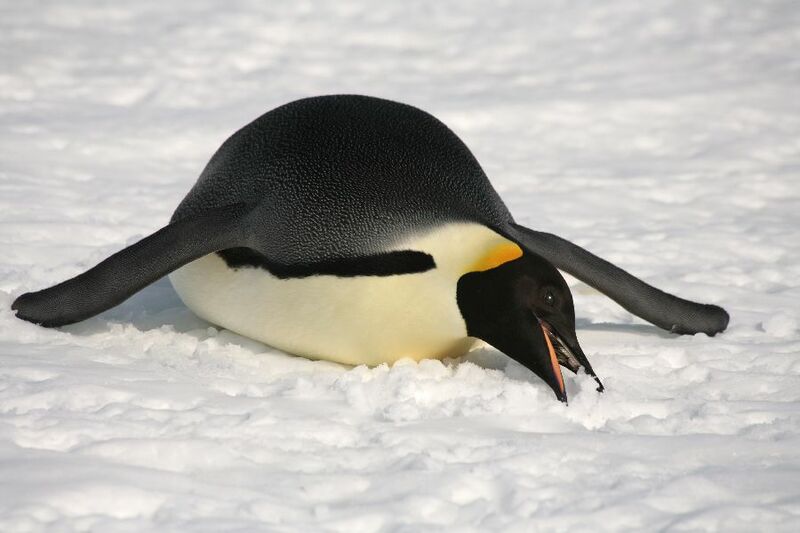 Whilst other penguins may also slide like this, in particular Adelie penguins, none of them travel comparable distances in this manner. Like King penguins, Emperors are not particularly shy and may approach humans. This is probably the result of the fact that they do not have any large land-based predators and thus can not conceive of humans as a threat. 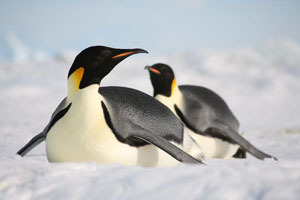 Leopard seals and killer whales are the main natural predators of adult Emperor penguins. On the other hand, chick mortality at many colonies is mainly due to the Southern Giant Petrel. Whilst commercial fishing may have some impact in reducing food availability, the primary concern is the impact of climate change. Emperor penguins predominantly breed on sea ice. 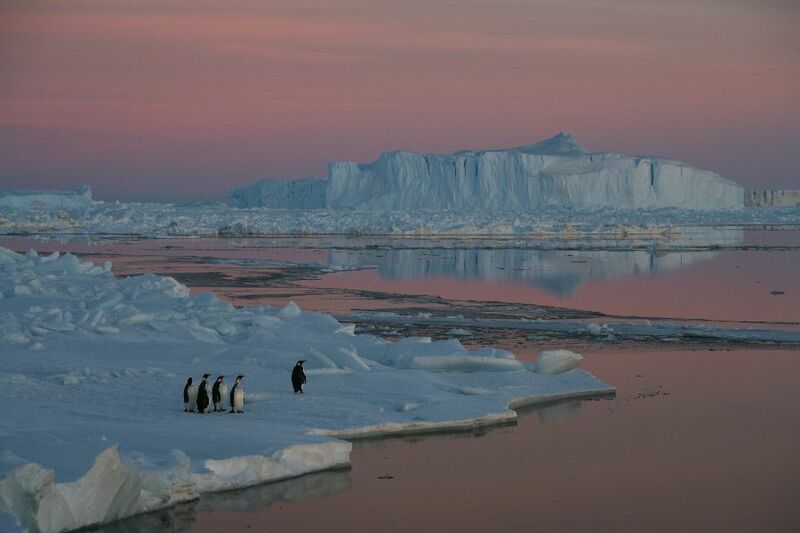 Breeding success requires that the sea ice remains stable until the chicks are ready to leave the colony. 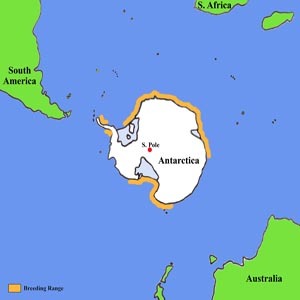 On the other hand, too much ice between colony and sea negatively effects the breeding success. 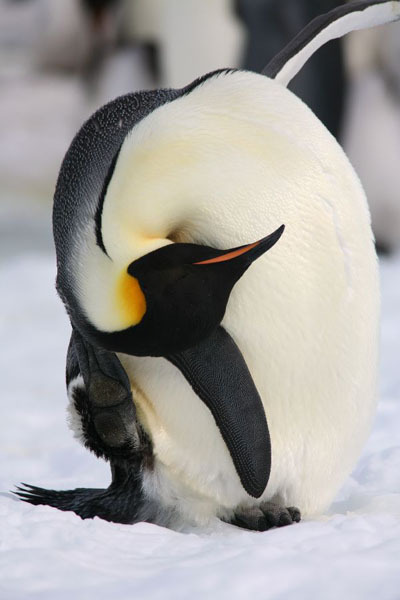 Consequently, climatic extremes as a result of global warming are a major threat to the Emperor penguin. Further, there are concerns about the effect of tourism on colonies, yet these would appear to be largely avoidable by sensible regulation of touristic activities, in particular the use of helicopters near the colony. Seeing Emperor penguins in the wild is usually only possible with the help of specialized expedition organizers. 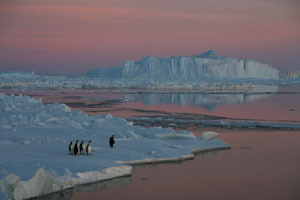 Quark Expeditions, for example, have run cruises to the Snow Hill Island colony. The prices unfortunately have to take into account the high costs of organizing such expeditions. Other options are available but tend to be even more expensive. 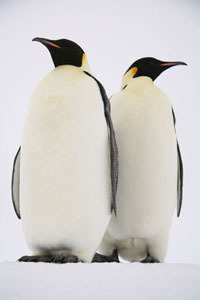 Captive Emperor penguins can be seen at Penguin Encounters at SeaWorld in San Diego, California or SeaWorld Ohio.